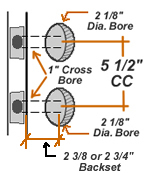 I was just looking through some of the Kwikset Hardware and thought how some of the so and so levers I was looking through combined with such and such deadbolts would look real nice and sleek. Looking through the website is how a lot of my blog posts come about, so I thought, who knows, maybe this post could help someone’s decision? The first combo that I pictured in my mind together was the Kwikset 993 Single Cylinder Deadbolt along with the Kwikset Signature Series Vedani Lever. So here you can see what it is I pictured inside my little imagination. I will admit, the shiny colors caught my first interest. Both the deadbolt and lever are in the polished chrome finish and I think it really looks super nice. After putting the deadbolt together with the lever, the finish isn’t the only thing that looks nice! I like the square rosette combined with the round. If you aren’t diggin’ the Polished Chrome finish like I am, both the deadbolt and lever come in other finishes such as, Satin Nickel, Venetian Bronze, Satin Chrome. When I started looking for pictures to show off on this post of some of the combinations that I was thinking may look really nice together, I found some pictures that were already put together. Kwikset must have read my mind, because I really liked these combos too. This is that same lever from the first picture, the Kwikset Signature Series Vedani Lever combined with the Kwikset 993S Single Cylinder Square Deadbolt. Also a nice combo. Again, maybe you aren’t a huge Polished Chrome fan, so be sure to check out the Venetian Bronze, Satin Nickel, and Satin chrome – any of these would look really nice too! The Kwikset 993 Single Cylinder Deadbolt, again, combined with the nice and unique Kwikset Signature Series Katara Lever. Again with the polished chrome, I know. I think it just looks so nice. Also! 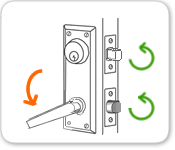 You can save 5% on all Kwikset Hardware! This offer may not last for ever… Ask us for more information if you are interested.